Positions in Arma could be either 2D, in which case it is in format [x,y], where x is the coordinate on the West – East axis and y is the coordinate on South – North axis, or 3D, in which case it is in format [x,y,z], where z is the height. The height relative to exactly what differs depending on the format of 3D position used. z is measured from the sea level which is constant across the map. 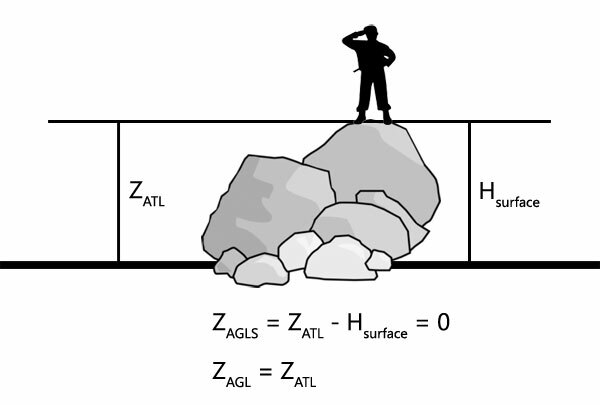 z is measured from the surface of the sea that could be higher or lower than sea level due to waves. z is measured from the terrain level which varies across the map. 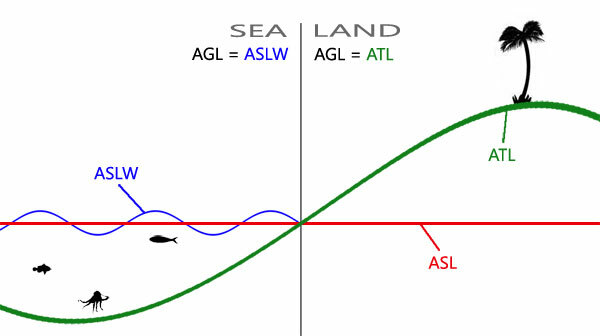 z is the same as in PositionASLW when over sea and is the same as in PositionATL when over land. Most commands either take or return PositionAGL. Over sea it gets even more complicated as instead of PositionATL, PositionASLW is used minus the offset for the surface height, presumably over waves too, as z seems static. As there is currently no way to obtain H of the surface, it becomes impossible to convert given PositionAGLS into other formats, unlike with other position formats. The function below will place passed object onto walkable surface, if there is one, otherwise on the ground. If only x and y of the position are supplied, the object will be placed on surface, if z is supplied, it will be treated as offset from the surface level. Alternatively, setVehiclePosition command can be used. It will put object onto nearest surface. Similar to PositionASL, however z is measured from the sea level to the the model centre [0,0,0] of an object, rather than transformed boundingCenter or land contact vertices. Relative position is normally an [x,y,z] offset from the model centre. The format used in configs, such as mission.sqm, is [x,z,y], where z and y are swapped around. One other command that uses this format is positionCameraToWorld. z in configs is measured from the sea level. This page was last edited on 17 April 2019, at 16:14.